As a blogger and busy mom that depends on being connected to the internet and social media for work, I appreciate brands like today’s sponsor, Anker, for making my life easier. 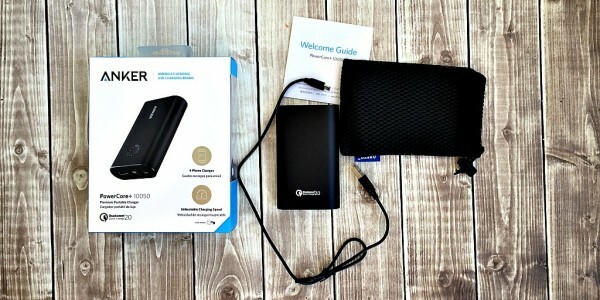 Anker understands the needs of today’s work from home parents and busy families and helps us stay connected with products like portable chargers, that can now be found at Walmart. Although this is a sponsored post, all opinions are 100% my own and may differ from yours. I will only endorse companies, products, and services that I believe, based on my own experiences, are worthy of endorsement. If you’re a blogger, freelancer, and/or writer, like me, you understand the importance of being able to have access to a laptop, tablet, or phone. There are deadlines to be met, social media connections to be made, and calls or messages to make or reply to… at any given time. This makes having a good portable charger a MUST. 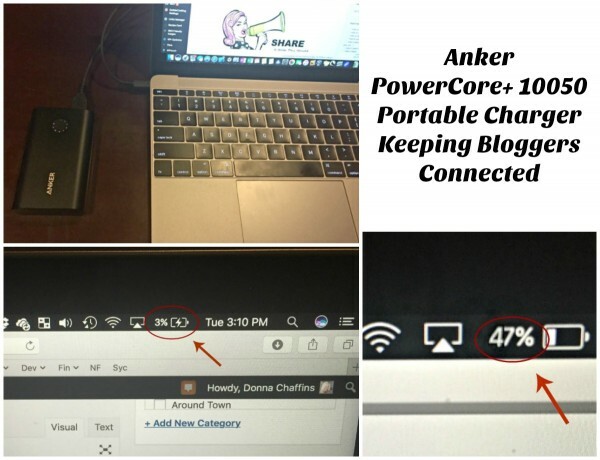 I’m using the Anker PowerCore+ 10050 Premium Portable Charger and find it is satisfying all my needs as a blogger. I can do a lot of my work on my iPad when I’m on-the-go, but if I’m gone all day and my battery is about dead or dead, my iPad is useless to me. Trust me, this has happened many times. 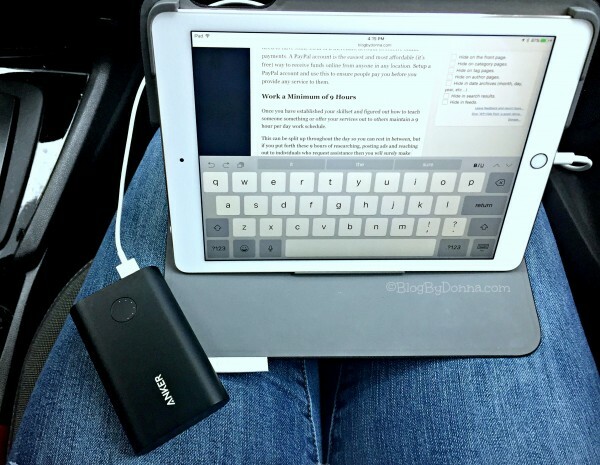 With the PowerCore+ I can charge my iPad which makes it great for traveling or road trips. I take photos and edit them on my iPad for later use. I use Memo to record blog post ideas. I write drafts or sometimes even write my posts from my iPad. My son is fourteen and has had an iPhone and iPad for three years now for school. He also participates in extra curricular activities that make it important to us that he has a phone and that it is always charged. 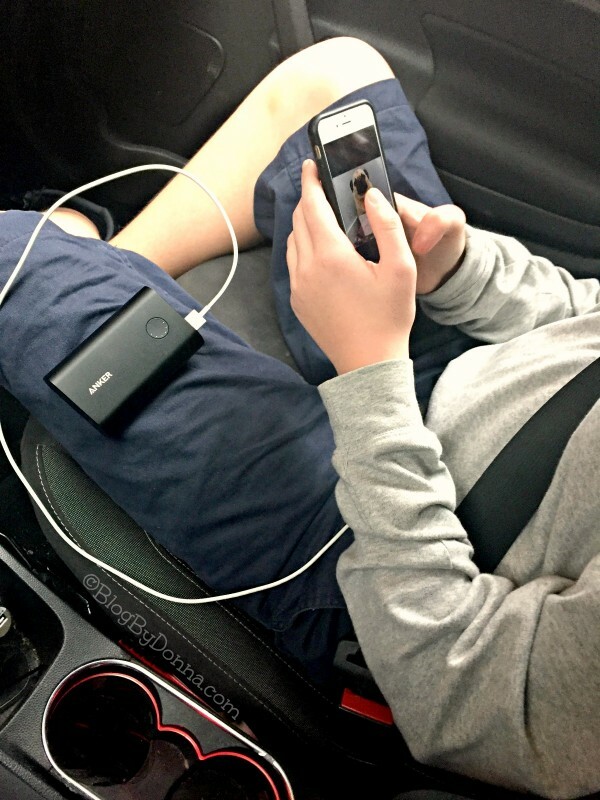 Not only is it crucial to have a charged phone if you’re a parent, it makes a blogger’s life much easier. You can recharge an iPhone about 4 times with the PowerCore+’s 10,050mAh capacity. I am texting or messaging clients often and I’m also in many Facebook groups where I stay in contact with fellow bloggers and clients. If you use your phone for business, the last thing you want is a dead phone. I was pleasantly surprised recently to discover that the Anker 10050 will also charge my husband’s 2016 MacBook. Since he works from home as a software developer, this was a very nice surprise. It also came in handy for me recently when we were on a road trip and he had his laptop, but I had forgotten my iPad. I got an email about a last minute blogging opportunity, but they needed it written immediately. It also required a lot of photo editing. As chance would have it, I had my Anker PowerCore+ 10050 in my bag. So, I grabbed his laptop and a USB to USB-C cable (borrowed from an Apple TV development box), and hooked up the MacBook to the power supply. I left the MacBook on and active, with half screen brightness and Wifi blasting. It would have been easier on the power pack if I had turned the MacBook off, but I needed to use the laptop as it charged. The MacBook was at 3% charge when I started, and to my delight the laptop indicated a charge after everything was plugged in. After about 2 and a half hours of continuous laptop use, the battery pack had been pretty much depleted at 47% charge on the laptop. I unhooked the charger and continued to use the MacBook for about an hour longer. The small portable charger gave me over 3 and a half hours of active, actual laptop use. All in something I can stick in my purse, backpack, or laptop bag. The size makes it perfect for travelling. Oh, I also have the new MacBook on my wish list, so I won’t need to steal my husband’s little MacBook since it mates so well with the Anker power supply. 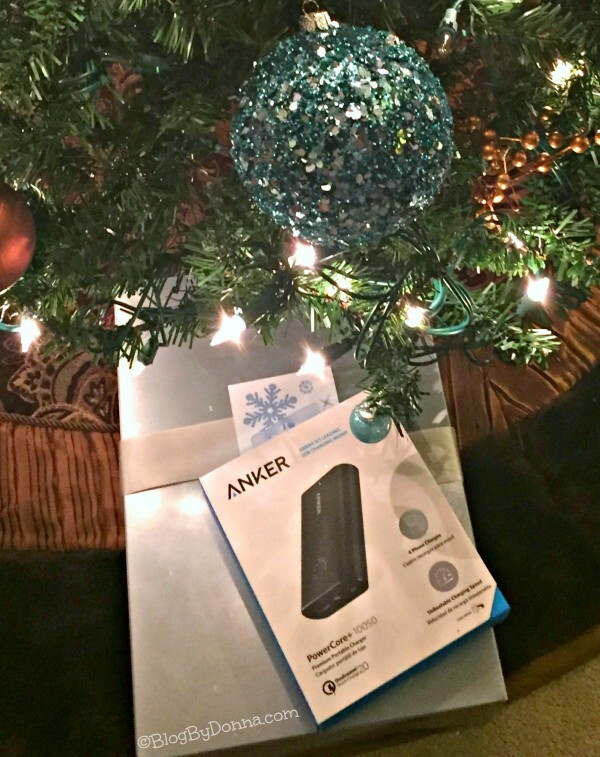 If you have a blogger, freelancer, writer, on anyone on your holiday shopping list that works from home or travels for work and relies on technology to get their work done, I cannot recommend an Anker PowerCore+ 10050 portable charger more. And now, you can find Anker products at Walmart. 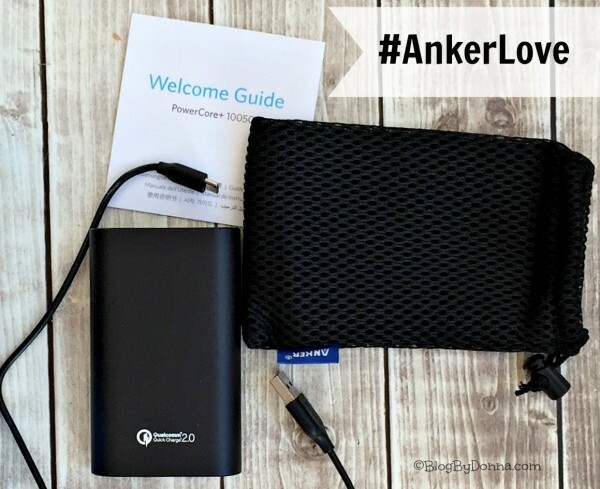 There are many reasons having a dependable charger is important, but for a mom and blogger on-the-go, the Anker PowerCore+ 10050 gives me peace of mind. Learn more about Anker and see the other products they carry.